Quickly identify areas that produce higher levels of fraudulent activity. 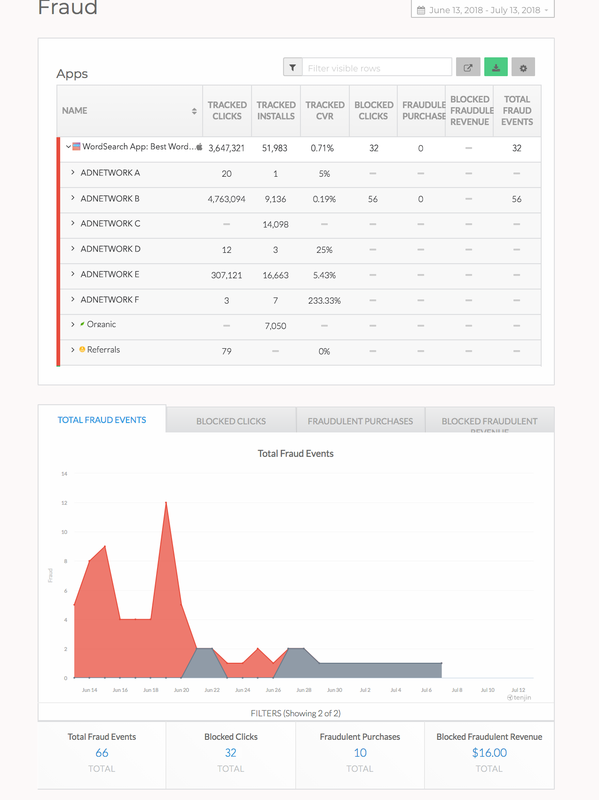 Block fraudulent installs, attributions, and purchases. We at Tenjin believe mobile publishers and solution providers each have a part to play in combating fraudulent marketing practices, and these tools are our latest contribution. We’re looking forward to helping our publishing partners use these tools to streamline their workflows, save time, and keep their user acquisition initiatives fraud-free. But first, we think it’s important to recognize just how damaging mobile fraud can be. Fraud is often misdiagnosed, but when publishers do encounter it, they need the right tools on hand to defend against it. Fraud forces marketers to spend valuable time tracking and combating attacks and discourages advertising partnerships beyond the Facebook/Google duopoly. Those publishers that do explore other networks often find themselves in contentious relationships as they’re forced to hold the ad networks accountable for fraudulent installs that can invalidate both marketing and behavioral data. Engineering teams inevitably have to get involved in order to quarantine bad data, taking valuable time away from product development, and delaying release schedules. Fraud is a problem that cuts to the core of an app publishing business, and addressing it demands a nuanced approach. Anyone who’s dealt with fraud will tell you how frustrating it is to keep track of it. As soon as marketers identify and prevent one vector of attack, fraudsters quickly adapt their tactics to exploit a different vulnerability in either install or purchase processes. It’s a game of whack-a-mole, and while fraud prevention will always demand a certain degree of active problem solving, we believe that reliable fraud intelligence can provide value in any counter-fraud initiative. That’s why our new tools focus on identifying fraudulent clicks in the install funnel as well as fraudulent post-install purchases. 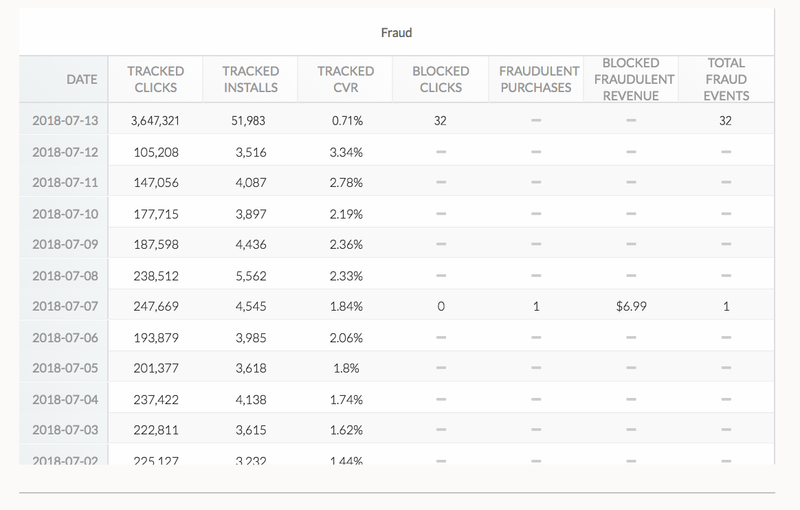 Tenjin’s fraud detection, reporting, and blocking works as a rules based engine, allowing custom rule definitions to filter or block fraudulent traffic and report on it. By tracking engagements at every stage of the user acquisition funnel and blocking clicks that fit the criteria of known fraudulent behavior, Tenjin marketers are able to filter out suspicious and non-genuine activity from their user acquisition and in-app monetization initiatives. Our flexible rules engine has been designed to recognize fraud based on classic signals like Mean-Time-To-Install (MTTI), click injections, click spamming, app version checks, country matching and more. Our rule sets are also flexible enough to account for new signals like app download times and file sizes. Key metrics like total blocked clicks and fraudulent revenue are tied to their associated networks and tracked over time, allowing marketers to correlate spikes in fraudulent activity to specific ad sets or changes in targeting criteria. Armed with this valuable data, marketers can adjust their tactics in response to fraud spikes, saving valuable resources in the process. We’re confident that these new features will be a powerful tool for publishers in the ongoing fight against mobile fraud. By affording marketers actionable intelligence that they can use to make quick pivots in their marketing initiatives, we hope to help them save time, protect resources, and ultimately exceed their growth marketing goals.